Sunnyvale natural indigo powder is a natural dye from Indigofera tinctoria leaves.Indigo is the only natural way to dye your hair black. It oxidizes when exposed to air and water so when the hair colour is mixed with hot water, the indigo is activated ready for use. Indigo contains a blue dye that when used with henna will dye your hair in a range of colours from reddish brown, light brown, brown, dark brown and black. Sunnyvale natural henna powder contains hennotannic acid, a dye that bonds with the keratin of hair, leaving behind a coppery red coloring. When it mixed with another natural herbal coloring- Indigo, with different mix ratio, it will dye your hair from light to dark brown color. 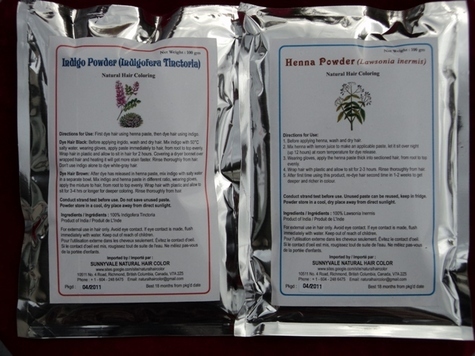 There is no PPD in these mixes, no ammonia, no peroxide, nothing but pure high quality powdered dried plant leaves, water and lemon juices. Sunnyvale natural hair color not only can dye the white hair, but also protect the hair and keep the hair shining, these colors are permanent. The henna/indigo special process can make your hair glossy, sleek and black. If you dye white hair with henna, you will get a coppery red. If you combine henna and indigo in the different mix, it will dye hair from light to dark brown colors. If you dye hair first with henna, rinse it out, and dye over that with indigo, you will get beautiful black results! After the processing, your hair will looks bouncy, straight and thick without any oily built-up and dandruff. The dye will have lingering effects in your hair and the highlights will be quite different. The finely ground Indigo and Henna Powder is the sifted in two-three layered process(sifting). It's available in air tight multi layered lami-nated aluminium pouches of 100grams. We also have the pre-mixed fresh natural henna paste/cone, ready to use right away, and it contains herbal hair conditioning-Cassia obovata to promote healthy, soft and shining hair. Payment term: Pay with INTERAC e-transfer or PayPal and your full purchase price is covered, customers are required to pay C.O.D. Delivery term: Canada Post Regular Parcel service, delivery within 2 days after receiving the payment. Local customers welcome to pick up at our location (10511 No.4 Road., Richmond, V7A 2Z5). Please call Iva when you come to pick up the products.